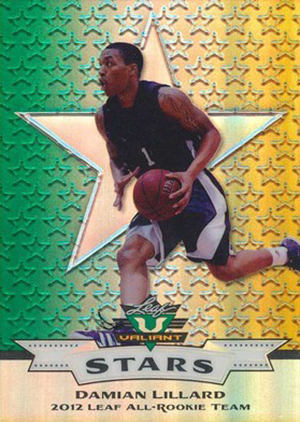 2012 Leaf Valiant Rookie Stars is a small factory set sold directly by the manufacturer exclusively on eBay. The 12-card set includes players from basketball, football and baseball. As the name suggests, all players are among the year's top rookies and prospects in their respective sports. Leaf exclusive, Damian Lillard, Robert Griffin III, Carlos Correa, Mike Zunino and Russell Wilson are among those in the set. The design fits in with the theme of Leaf's other Valiant sets. A chromium-like backdrop comes with an almost Refractor-like rainbow finish. Besides the design, 2012 Leaf Valiant Rookie Stars also has a familiar parallel scheme. Orange (#/50), Purple (#/25) and Gold (#/10) parallels were sold as sets for a fixed price. Black (#/5) and Red (1/1) were listed individually as auctions, allowing collectors to set the price. Leaf confirmed that a total of 120 base sets were produced. 12 cards. Sold direct as a factory set by Leaf on eBay. 120 base sets produced. PRODUCT IS GREAT IN COLORS.LIMITED PRODUCTION ON EVERY SENSE OF PURPOSE,COLORS,PLAYERS,ECT.